This post is meant for those of you who love to style their hair. I will review this TIGI Bed head serum which is a thickifier, stylizer and Energizer. With thickifier it means body and volume to the hair and energizer means that it gives life to the limpy hair and stylizer because it helps to style the hair. So, is this really does what it claims. Let’s read on to know more. 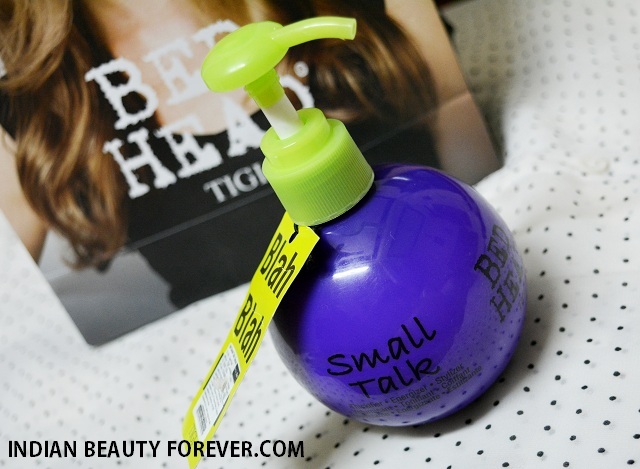 Price of TIGI Bed Head Small Talk: It is 800 Rupees for 200 ml. You can buy this from Flipkart. 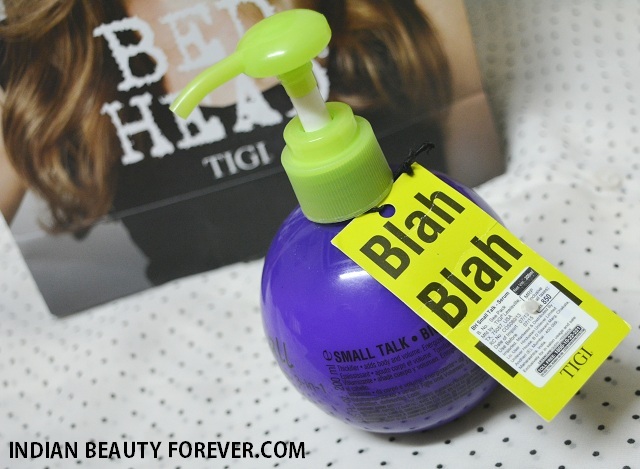 TIGI Bed Head Small Talk comes in and extremely cute looking chubby bottle which is a perfectly round with a pump dispenser. When I got this, I couldn’t help myself admire this purple round bottle. So, even if it gets finished, I will fill it with some other hair styling product as it is too cute to be thrown. Anyways, this hair styling product claims to thicken the hair, energizes them and to style them. The product is thick like a hair conditioner and white in color. It smells very good and I have noticed that the fragrance stays on till the time you wash your hair. I loved this feature as in summers when we are more likely to sweat, it will be good for a hair product to give us nice smelling hair but some of you can find the fruity smell to be too much for the first time. The product is a thick lotion like which is very creamy and very sticky. To use this, just take some on the palm and apply all over the hair and spread nicely. Take some more if the hair is lengthy or you need more to coat the hair strands. The first thing I noticed after I finished using this was that it had actually given some volume to the hair. With volume I mean, the body as my hair is very silky and due to that they will cling to each other and they will appear a lot lesser in volume then they are so what this has done, it had made the hair strands separated and they appeared thicker. So, it had thickened the hair and given a life. If you have limpy hair then I am sure this will give them body and life. TIGI Bed Head Small Talk also helps to make the hairstyling easier, I can use rollers and it will help them curl faster and curls stay longer. The back combing that I do, It also helps the hair to stay that way instead to getting back to normal. One more thing, as my hair is very silky, it gets really difficult for me to do French braids as they will not last for more than 15 minutes considering my hair is layered as well so there too it has helped me to style the hair. I have also read that it protects from the heat damage as well which is good if it does. After using this for 3-4 times, I am satisfied with this product but I also observed that it makes the hair greasier the second day when I comb the hair. This is the problem with the oily scalp or oily hair so, if you have dry hair then you may not experience that problem. The other thing is while you are done with the styling and spreading it. Wash the hands as it leaves a slimy residue which needs a thorough hand wash. So, overall, if you need a hairstyling product for your limpy hair to get some texture, body and volume then it is the product. I am really satisfied with this. Hmmm, I was thinking of giving this a try ! Thanks for the lovely review ! The packaging is cute. And I'm glad it smells good too! I personally really like the Bed Head products. I totally loved its packaging, I am not that much into hair styling products but going by your review this one can be given a try !